How might we instill and maintain the confidence of young women in their STEM abilities? The One Stone team set out with a goal to help young girls instill confidence in their STEM abilities. During the understand and empathize phase of the design thinking process, the student planning team discovered an insight about women being the minority in STEM fields: women like to work together and they also like to help people. Women and girls often choose to not continue in STEM fields because they think the work won’t be ‘helpful’ or won’t include a strong social aspect. Resolve was created as a project to help fix those two fallacies. The team wanted to reach girls in the 8th grade in hopes of sparking their interests prior to selecting their high school courses. Students were given “case files” of a person with a disability, they formed teams to create and design an adaptive device to solve a problem. The tasks exposed recipients to elements of design and biomedical engineering at a basic level in an effort to boost interest in a STEM career. The One Stone students rolled out the project working with a group of 8th grade girls from Fairmont Junior High. The One Stone team introduced the elements of design thinking and assisted in brainstorming, ideating, prototyping and testing their devices. There were five unique adaptive devices created that the One Stone students had not envisioned previously in their own prototyping. The project wrapped up with teams sharing their inventions with the rest of the groups. Recipients got a one-on-one mentoring experience with One Stone members. From pre and post survey data, students increased their interest in future STEM careers from 20% to 85%. At the end of the event, 100% of students feel that math and science can have an impact on someone’s life. How might we excite middle schoolers about becoming advocates for bike safety? 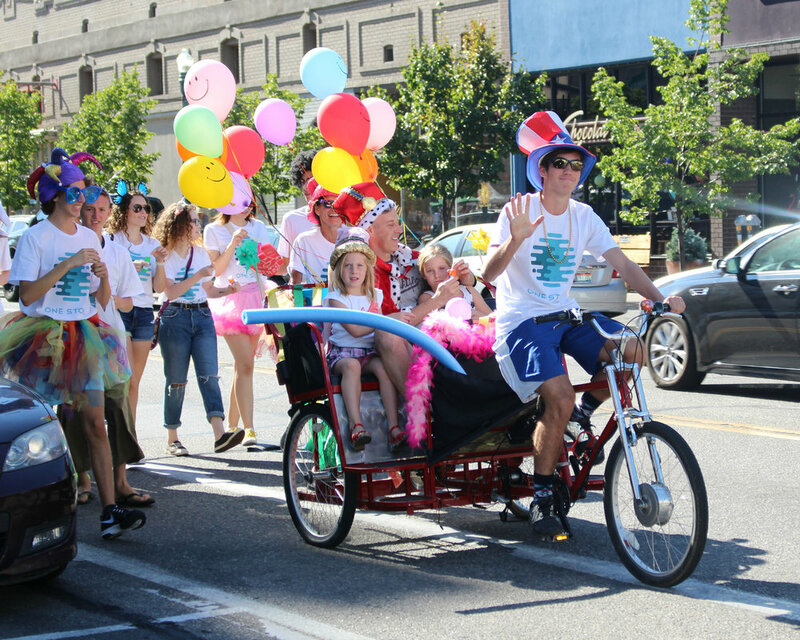 A group of One Stone students spent their summer researching an issue often in the news in the Treasure Valley: bike safety. Since 2007, there have been 1,195 bicycle crashes — including 11 fatalities — in Ada County. Speaking to experts in the community including Boise Bicycle Project, Treasure Valley Cycling Alliance, Idaho Mountain Touring, and Idaho Walk Bike Alliance, the team realized younger students who often ride their bikes to and from school could benefit from learning how to keep themselves safe from accidents involving cars. During the ideating stage of the design thinking process, the Bike Safety team recognized that a common theme in accidents involving kids was a lack of visibility during dark hours when kids ride their bikes to and from school. The team partnered with Mrs. Johnson’s 6th grade class at Riverside Elementary, where the majority of students ride their bikes, for an interactive event called, “Reflect Yourself!” The One Stone team began by gathering the 6th graders into the gym where they could see the difference in how much time it takes cars to stop for pedestrians that are easily visible due to bright and reflective clothing compared to those that are wearing all dark colors. After seeing for themselves how much of a difference wearing reflective materials makes during times of low visibility, the 6th graders were given reflective tape and key chains to decorate their backpacks, helmets and bikes. Safe Routes to Schools donated front and rear bicycle lights for each student and the class received pamphlets that the team created about safety tips for riding at night. 28 6th graders - increased bike safety - check! What did participants have to say in their own words? "Thank you for teaching us about bike safety. The reflective tape makes me feel safer at night." "You made my backpack WAY cooler!" How might we equip kids entering 6th and 7th grades with methods to cope with the emotional challenges of junior high? Launch was an event at the Boys and Girls Club of Ada County aimed at preparing 6th and 7th graders for the social and emotional challenges of junior high. Through the design thinking process the team looked at the many factors that lead to mental health challenges in kids. After speaking to several mental health professionals and reflecting on their own experiences, the team decided to take on the issue of “transition.” Many children face additional stress and anxiety during times of transition, whether to a new place or stage in life, and the additional emotional challenges can create or aggravate existing mental health issues if children don’t feel prepared. From this insight, Launch was born. One Stone members shared personal stories from their junior high experiences and led activities relating to the themes of 1) positive self image, 2) building a support system, and 3) dealing with big emotions. Recipients created skits helping them practice how to handle real-life situations such as arguments with family members or friends, as well as wrote letters to their future selves full of advice, reminders, and encouragement. The event ended with an ice cream treat and reflections on how to make the transition into Junior High as easy as possible. How might we educate youth and their parents about the importance of healthy eating? Through the design thinking process, the One Stone team researched the effects nutrition has on physical and mental health by meeting with local nutritionists, watching TED talks and reading through many nutrition sources.